Home » Uncategorized » Free the Soil meeting in Berlin! 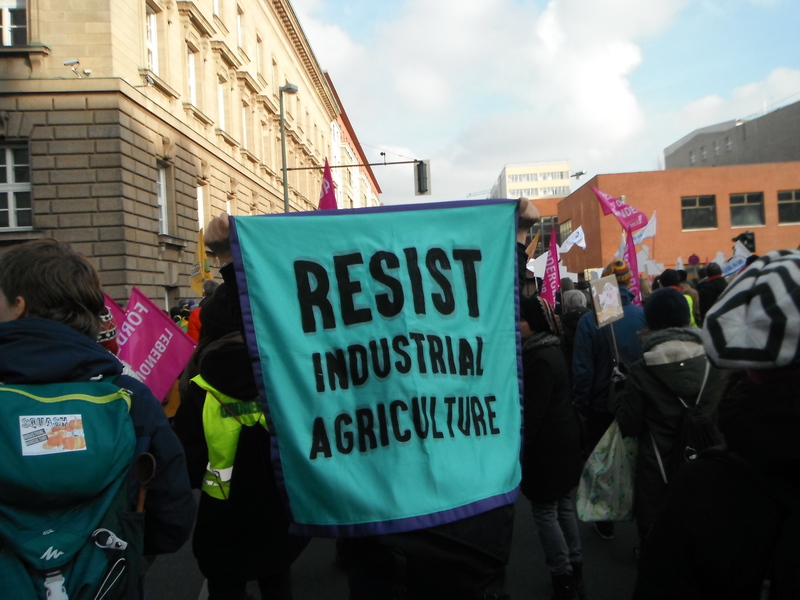 During the weekend of January 18th-20th 2019, two ASEED volunteers travelled to Berlin for the second international meeting of Free the Soil. Free the Soil is a growing network of dedicated people committed to highlighting the devasting effects of industrial agriculture on the planet and all life forms with its huge contributions to climate chaos. It is estimated that 44-57% of all greenhouse gas emissions come from industrial agriculture. These outputs can be found in the form of synthetic fertilizer-, pesticide- and herbicide use, land use change (in particular deforestation), transport, processing and refrigeration. Free the Soil has two specific goals: The first is to name and shame chemical fertilizer giant YARA. YARA is the world’s largest producer of synthetic nitrogen fertilizer, which relies heavily on fossil gas in its production process. The second is to collectively organize an act of mass civil disobedience, blocking infrastructure at their production plant in Brunsbüttel, Germany. This will happen in late September of this year. With a packed weekend programme and a room filled to capacity we got on with organising the mass action and camp. Among other things, time was given to discussing consensus based decision making, the action codex, the programme for an agriculture and climate justice camp and mobilisation tactics. Each working group had time to get together to prepare and plan their next steps which resulted in some lively discussions! There was even time to play some games to get us thinking creatively about how to plan the action, and also to get to know each other a bit better. Saturday coincided with the Wir Haben Es Satt! (We Are Fed Up!) 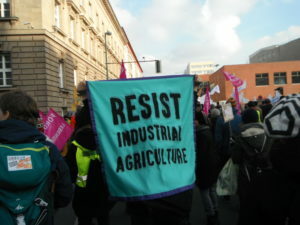 demo in Berlin, which demands a more just agricultural system. Participants ranged from farmers to climate justice activists, animal rights campaigners to families. This was the 9th edition of the demo and there were 35,000 people attending! We happily joined the crowds to make our voices heard. Stomping our feet to keep warm we chanted “No more gas, coal or oil! Shut down Yara, free the soil!” It was another great opportunity to talk tactics and swap stories about ourselves and other demo’s and such that we have participated in.